Does the use of keywords in your post title and content that are related to popular online news stories really matter that much? Oh, you betcha! See how one of my posts got to the front page of Google in a hurry. A few weeks ago, everybody and their brother who blogged about online marketing posted something on their site concerning the recent changes Google made to the page ranking algorithms. Most of that news surrounded the hard hit taken by content farms and SEO cheaters that were trying to game the ranking system. 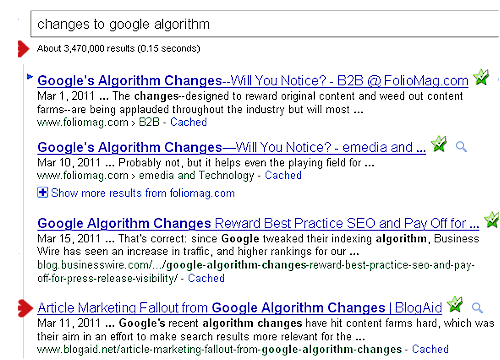 Of course, I made a post on BlogAid about it too, titled Article Marketing Fallout from Google Algorithm Changes. That was on March 11th. By the 15th I began seeing spikes in the site analytics and by the 20th there was a real surge going on. I checked to see what was causing the jump and found that there were a lot of hits on the keyword phrase “changes to google algorithm”. I copied that phrase, without the quotation marks, into Google, and the image below shows the results. The red arrow at the top shows that there were over 3.4 million matches. The red arrow at the bottom shows that the BlogAid article is listed fourth! I checked another search phrase that was showing high in my analytics and found another one of my articles on the front page of Google as well. Needless to say, I got pretty excited about being on the front page. But then I remembered that the Google Personal Search feature impacts what you see in the results. Here’s how it works. If you’re signed into your Google Account, the results you see with any search is based on your Web History. When you are not signed in, a cookie on your system stores up to 180 days of logged-out search activity. The items in your individual histories help determine what you will see in your current search. In other words, not everyone sees the same thing for the same search. To further confuse the issue, mobile and desktop searches are not the same either. With a mobile device, Google assumes that you will want to see relevant results in your area. I emailed several of my buddies and long-time clients. Some of them visit BlogAid regularly and some don’t. I asked them to search on the same keywords I had used. The folks who visited BlogAid more frequently saw my articles somewhere on the first page, including in the first and second spots. Folks who don’t visit BlogAid much at all, like a few friends who are not into online marketing, see the post several pages back. Google extended Personalized Search to signed-out users worldwide in 2009. There has been a debate running in SEO communities ever since. The concern is whether it has helped or hurt traditional SEO methods. The jury is still out and will likely never reach a verdict because so much of the focus has jumped to mobile SEO now. Since the latest algorithm change by Google, it seems clear that they are dedicated to creating a more level playing field for organic SEO-building methods. That will last until folks figure out how to game the system, and they will. They always do because there is big money at stake. I’m still stoked about hitting the front page of Google twice in one week without the search phrase containing any arrangement of the word blogaid. I’m also tickled about being in the top four pages on the search results of someone who doesn’t frequent my site. Here’s the method I’m using. I use keywords in the title and content of the post. I write about topical stories whenever I can. And, I post regularly. I’m also active with posting comments on other blogs and Facebook. It’s good to engage folks. If my comments are helpful, perhaps they look at BlogAid and it then becomes part of their search history. Are you ranking on Google? What methods are you using to organically grow your audience? If you have a moment, do a Google search on changes to google algorithm and see where my post on Article Marketing Fallout shows up for you. This is a very interesting post. I have know about Google’s personal search feature for a while. While it has it’s good points, it makes it hard for people to know how their site really stacks up. Congratulations on your SERP ranking and thanks for sharing your observations. Thanks, Tony, and agreed that it is rather difficult to make sense of the various metrics to determine how well your site is doing and what’s causing the success. I’ll be releasing a case study soon for a brick-and-mortar client who is consistantly generating new foot traffic in the door by doing the bare minimum in online promotion. Should be a good comparison study of what really moves the needle in different niche markets. Always learn a little something when I read your articles. Didn’t realize that various forms of search/levels existed. Thanks for the detailed account using a real life example. Makes it much clearer to a newbie! Thanks Still Blonde. Following metrics and the things that affect rankings is a field of expertise all unto itself. I’m grateful for all the buddies who helped me verify the rankings. The personal search option makes it rather difficult to judge what’s happening just by looking up your own page. Just did a search as per your request, using my iPhone as I’m recovering from spot of illness and restricted to bed! Using those exact terms the google result showed your position to be on page four: #40 to be exact. Well done, a brilliant result! I recently tried a similar search within the LinkedIn platform for ‘virtual assistant’ and was amazed at my high ranking until I learned more about its algorithms. In order to return the purest of results I needed to ask someone to do the search who wasn’t connected to me and who had NO other Virtual Assistants in their contacts list. I did get a degree of satisfaction from the exercise, but more importantly it taught me lots about search algorithms! Glad you’re learning about algorithms. It’s really tricky business and as time goes on, it will be harder and harder to find folks ot help you search. I’ve wiped out my Google history a couple of times so I could look fresh at my rankings. But, that ends up being an inconvenience to me to use Google for personal reasons ;-) I’m glad to know that particular post has not fallen below #40 so far. It’s been a few months and is hanging in there pretty well. It turns over so quickly.